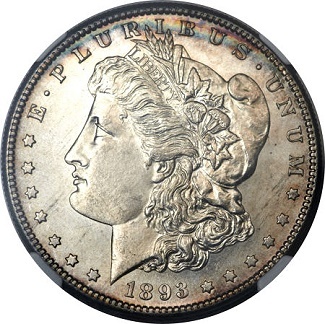 Perhaps the most beloved American coin among modern collectors is the Morgan dollar. It is rivaled only by the Lincoln cent, but has more widespread appeal thanks to its silver content. A large number of Morgans were melted down during the First World War, which adds to the collectible appeal of those that remain. These silver dollars also offer a number of well-documented die varieties for collectors to pursue. Now, a stunning number of forgotten Morgan dollars are about to hit the numismatic market. The U.S. Mint, and the Treasury Department in general, has a history of holding large stockpiles of precious metal coins. At times they have been melted down, distributed to the public in special sales, or discovered long after the fact. This is one of the latter cases. 16,000 Morgan dollars sat untouched in canvas bags in a vault at the New York Fed for five decades. No one had touched them since 1964. At long last, they will be in the hands of coin collectors. The coins were all graded by Numismatic Guaranty Corporation (NGC), one of the two leading third-party grading services. They range in date from 1878 to 1889 and include branch mint issues from San Francisco and New Orleans. Many of the Morgans received very high grades due to their exceptionally good state of preservation. The NGC label on the coin holders identify that they are from the "New York Bank Hoard." The new provenance designation adds these Morgan dollars to a long line of hoards that have been found tucked away and forgotten in American bank vaults. Another prominent example is the Wells Fargo Hoard of $20 gold double eagle coins that was similarly found in their original sealed canvas bags. Former American Numismatic Association (ANA) president Jeff Garrett, who assisted in the certification of the hoard, described the unveiling of the coins as opening a "numismatic time capsule." Not only is the fantastic condition of these coins an exciting development for the numismatic community, but coins from interesting or historic hoards generally command an extra premium in the marketplace. The grading of these coins was reported by several news outlets in the industry, including CoinWeek.